Today’s Nice Price or Crack Pipe Peugeot represents one of the last RWD models the company ever introduced. It’s also one of their first with a turbo. Let’s see if its price make its purchase the first or the last thing you’d ever do. A laser beam is coherent light, meaning that the laser creates a beam of spatially coherent light, that can burn holes in missiles, play music from a compact disc, or drive a cat bonkers. In complete contrast, there was little coherence in the vote for last Friday’s 1986 Chrysler Laser X/T as it finished the day with an incredibly narrow 51% Nice Price win. Still a win is a win and maybe whoever buys that Laser will use it to the delight of cats, and not taking out missiles. There are rumors floating about that PSA (no, not the moribund west coast airline, the French automaker) might be contemplating a return engagement here in the U.S. of A.. Even if they do decide to pull le trigger, it’ll be years before rabid Francophiles living here will be able to get their Pug on again. 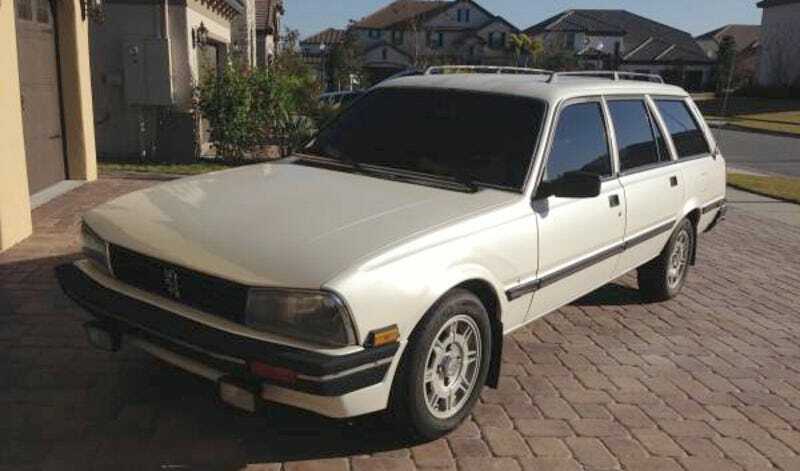 To tide over those waiting for the tide to turn and Peugeot to return, today we have a 1988 505 Estate, which comes from the company’s last fateful run at the U.S. market. Peugeot debuted the 505 in 1979, and it served the company faithfully across global markets for the next twenty-years. The estate edition was introduced in 1982 and featured a significant stretch in wheelbase over its progenitor sedan - 114-inches vs. 108. That made for an available third row of seats in the back dirty, and a turning circle almost as impressive as the Arctic Circle. Over the course of its run the 505 was fitted with a number of different gas and diesel mills, but here we’re presented with its turbo-iest. That engine is a turbocharged and intercooled SOHC 2,155-cc four, which offered up a respectable 180-bhp. This was a Simca engine, used by Peugeot after they bought the smaller firm and it was unique to the U.S.-shipped wagons. The ad says that this one has less than 40K on the clock, while the four-speed automatic (ZF4HP22) has a tad more at around 50K. The car overall is claimed to have a nominal 117K under its belt. The car seems pretty fully equipped, with power windows and locks. It lacks a sunroof, and seems to be a five-seater rather then the more desirable—if you’re a follower of the Quiverfull movement—eight-place model. The interior looks to be in serviceable shape and this being a later car it has the redesigned dash that honestly has all the charm of institutional housing. At least it all seems to be there, because trim parts for these will be problematic to obtain these days. The exterior is likewise presentable, and comes with an added plus of Euro lights which really complete the Pininfarina bodywork. Tinted windows all around denote this as a Florida car, and may not be legal in all states but it still looks cool. New tires on stock alloy wheels add to the car’s plusses. We now need to decide if this French Estate’s price tag might also be added to the plus column for the car. The asking is $4,950, OBO. We don’t do OBO, so you’ll just have to work with that $4,950. What’s your take on that price for this low-mileage but long wheelbase Pug? Does that make this a 505 that you would LOL all the way to the bank? Or, does that price make you want to take French inaction? H/T to M0L0TOV for the hookup!